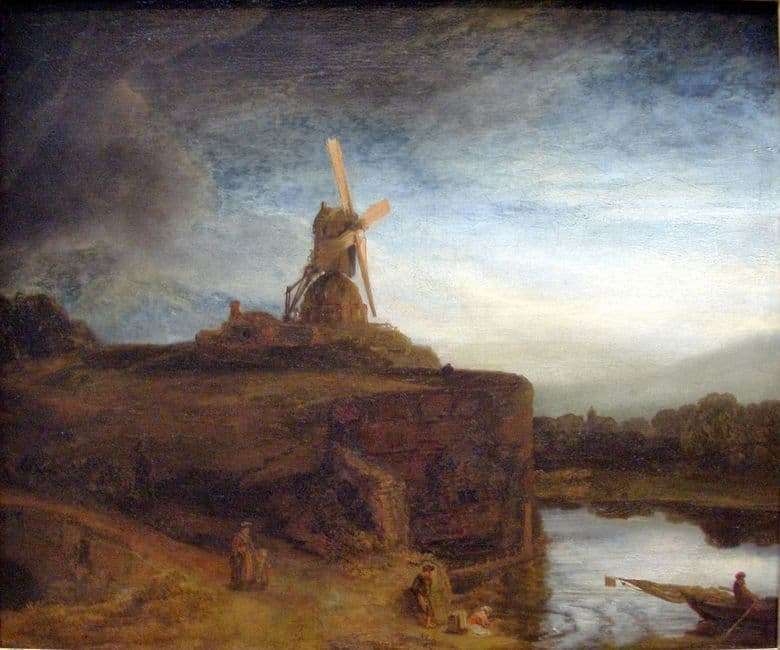 In his work Rembrandt repeatedly portrayed the mill, seeing in them his own charm and beauty. This picture is one of the greatest works of the author. The heavy atmosphere of the canvas is paired with the image of a beautiful, static landscape. In the central part of the work there is a mill with bright massive blades. The design symbolizes reliability, protection of the tranquility of the earth and people. The mill was not worked out as detailed as the master’s engraving, but a certain nebula of the work gives it a special atmosphere and realism. On the left side of the cloth one can see a bridge, through which a woman with a child passed to the lake. On the shore of the lake is a woman washing clothes at the very edge of the water, while the man behind her is pensively watching the laundress. On the right side of the picture, on the water itself, there is a boat, but most of it is taken out of the canvas, while we can only see a man rowing with oars. In the farthest part of the picture one can see dark trees among which are cows. Above the trees the sky illuminates the last rays of the sun before the evening comes. The lightest part of the canvas frames the mill on the right side, emphasizing the dark shades that dominate the left side of the canvas. The gloomy part of the restless sky sets the tone for the whole work. Most likely, the intense darkening of the picture is connected with the author’s experiences, which arose due to strong financial problems in a certain period of the author’s work. This work conveys the author’s delight and quivering love for the landscapes that struck him, and the individual elements of the painted picture embody the inner world of the immortal master Rembrandt.